Though the administration signed an executive order ending family separation in June, our partners on the ground tell us that separations are still happening and families still aren’t reunited. Asylum seekers are being turned away, and Border Patrol’s system of abuse and terror against immigrant communities continues as the border becomes increasingly militarized and the administration works to control the mainstream narrative. These heavy handed tactics and the president’s vitriolic rhetoric have also left immigrants living in constant fear for their families’ wellbeing and safety. In order to fully inform the public of the situation at the border and fight for immigrant rights, stories from the community and eyewitness documentation of abuses must be seen and heard. This is why WITNESS’ U.S. team has continued to expand our Eyes on ICE work to the U.S.-Mexico Border with a series of Eyes on the Border documentation and video advocacy trainings in the Rio Grande Valley, Texas. 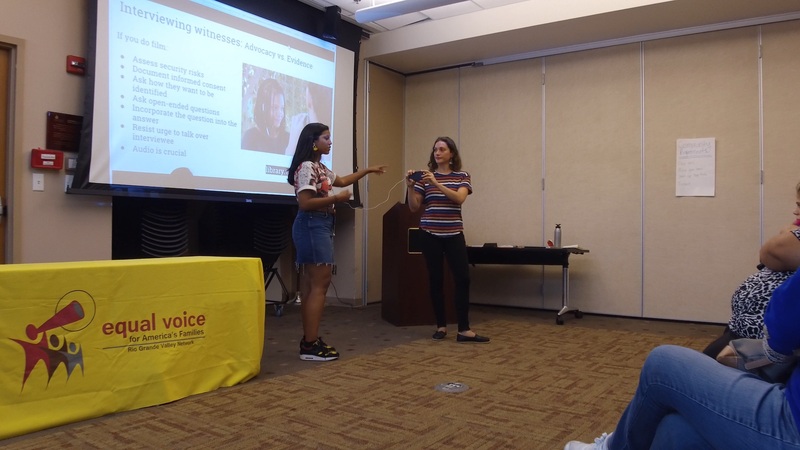 In partnership with The Rio Grande Valley Equal Voice Network (RGV EVN), we conducted three trainings focused on using video to expose abuses by Border Patrol and advocate for immigrant rights. RGV EVN is a network of organizations offering direct services to local immigrant communities, united by a vision of organizing constituents into a local force for lasting social and political change in one of the poorest and most disenfranchised regions in the U.S. Network members focus on several working groups, including: immigration, civic engagement, education, jobs, housing and health. We also participated in two guided tours of the pedestrian bridges leading to the international ports of entry. This helped us identify opportunities for and challenges to filming in the ever changing political and physical landscape at the US-Mexico Border. We crossed between Brownsville, Texas and Matamoros, Mexico, and Hidalgo County, Texas and Reynosa, Mexico with folks from ACLU of Texas, RGV EVN and other local volunteers who help meet the humanitarian needs of asylum seekers at the bridges. The crossings helped us to assess the situation on the bridges, speak with folks waiting to gain entry into the country, and think through safety and security concerns for filming and documentation. Unfortunately whether or not you can film on the bridges remains unclear, as the situation appears to depend on who owns the bridge leading to the point of entry, the specific risk profile of the person filming, and the mood of the Customs and Border Patrol agent on that particular day. This is why our trainings focus on equipping individuals with the information, tools and critical skills to make difficult decisions about filming in moments of crisis, since the situation is rarely black and white. 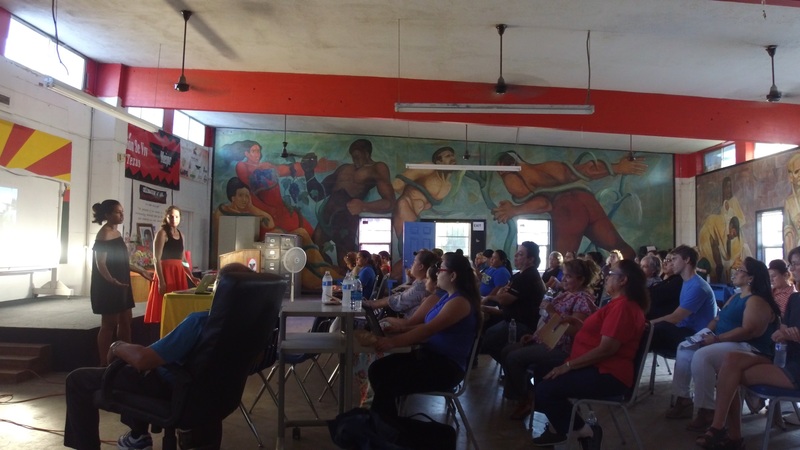 In addition to trainings and bridge crossings, we also conducted valuable one-on-one meetings with RGV EVN’s Civic Engagement Working Group about how to incorporate video advocacy strategies into their “get out the vote” campaign. 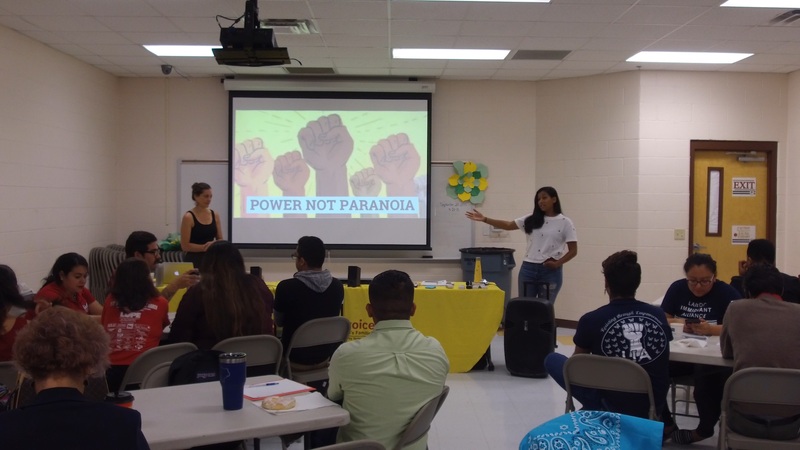 We also met with powerful intergenerational organizers from, ARISE, South Texas Civil Rights Project and Fuerza del Valle to learn more about their work, past and present, and how video might be able to support their efforts moving forward. We are so humbled and energized by the incredible, intergenerational, thoughtful organizing spirit of the immigration activists and community members we met in RGV. They are the ones who have been upholding and protecting immigrant rights for decades past and will for decades to come. It is imperative that their stories – successes, challenges, and the abuses their community face are witnessed by the rest of the country, and we look forward supporting them in those efforts, and continuing our collaboration with the RGV EVN community. This article is part of a WITNESS project, EYES on ICE that offers a deep dive into how to safely, ethically and effectively document immigration abuses through tipsheets, case studies, videos, and more.